It’s no secret that fitting everything you own into an apartment can be tricky. Even if you have a sizable apartment, storage space can be hard to come by. The best way to maximize your apartment storage space is to get creative and think outside of the box (pun intended). If you don’t already have a lot of storage in your apartment, some DIY tricks are just what you need. We’ve compiled some storage tips that don’t require turning your apartment upside down or even doing anything particularly difficult – it’s all about making your life easier and adding space! Use baskets – Hang baskets, put baskets under your vanity, even add some decorative baskets. Baskets are your new best friend. If you buy baskets that you like, you can easily maximize your space with them. Smaller baskets are great for your bathroom vanity or for storing small items in the kitchen. 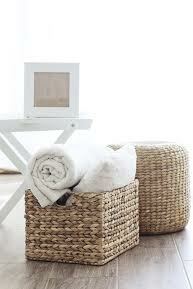 You can use bigger baskets for towels, blankets, and dirty clothes to add some space in your bedroom. The great part about them is that they keep your things organized and can usually fit under beds or in small spaces. Buy a commercial shelving unit – You know the big silver shelves that were so prominent in the kitchen at your first restaurant job? They can still be great for your home. If you find that you don’t have enough pantry space or there’s just nowhere for you to store your crockpot, a commercial metal shelving unit can help you get stuff out of the way. You can even add a decorative flair to make it feel less like it belongs in a commercial kitchen and more like it belongs in your home. Make things do double duty – By adding a skirt to your coffee table or making a storage ottoman, you can save space and create extra storage (there really are some great DIY projects for space management. Check out our Pinterest for ideas). Have an extra bookshelf? Create a wall-to-wall, ceiling-to-floor bookshelf space. It’ll look built in and give you LOTS of space to store things and add some creative flair. This entry was posted on Friday, September 19th, 2014	at 2:19 pm	. Both comments and pings are currently closed.